In this chapter, we examine the original Vygotskian conception of the zone of proximal development in the context of developmental education and Hedegaard’s contemporary research related to learning and development in everyday life. In 1935, L.S. Vygotsky published the article, “Problems of education and mental development in school age.”. That paper attracted attention. At that time, developmental education was understood as education aimed at the zone of proximal development, that is, as leading development. This approach to education and development raises many theoretical and practical questions. 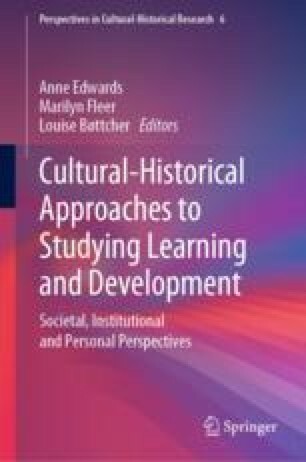 In this chapter, we offer three ideas linked to Hedegaard’s conceptions, which will allow for a reconsideration of the psychological content of the concept of “developmental education.” The first idea relates to the understanding of the zone of proximal development and its transformation to actual development. The second idea relates to L.S. Vygotsky’s division of education into spontaneous and reactive one. This idea coincides with Mariane Hedegaard’s analysis and results of her research. On one hand, she emphasizes the importance of motivated learning in a child’s life. On the other hand, she pays great attention to child’s everyday life and its role in his or her psychic development. Finally, the third idea relates to the role of consciousness in L.S. Vygotsky legacy. There are reasons to believe that the developing nature of education, according to L.S. Vygotsky, is directly related to changes in a child’s consciousness.